Stored properly, fresh garlic will last for months. Commercially, garlic is stored between 30 and 32 degrees. In most households that is not possible. 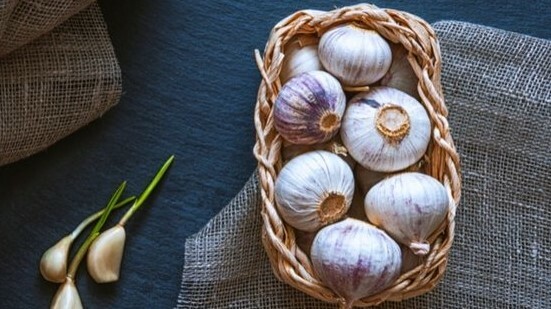 Here are some other ideas on how to store garlic. Bundle garlic in bundles of 8 to 12 bulbs by tying the stalks and hanging it, bulb down. Store garlic in a cool, dry place, with plenty of circulation, away from sunlight. You can purchase a ‘garlic keeper’ or simply store it in a wire basket under a flower pot. For a homespun display, you can braid softneck garlic stems together, adorned with ribbon and dried flowers, and hang it in your kitchen. It’s easy and you’ll be amazed at how flavorful fresh garlic powder is compared to commercially purchased garlic powder. Cut the root end of the clove (you may also peel the clove, but it is not necessary). Lay the cloves in a single layer in your dehydrator and dehydrate for 16+ hour depending on your dehydrator and the size of the cloves. The skins fall right off! You can store whole cloves or grind them into powder. To make garlic salt, mix 3 parts salt and 1 part garlic. Peeled garlic cloves can be stored in wine or vinegar and refrigerated. Garlic can be stored in this manner for about 4 months. Discard if you see any signs of mold or yeast growth. While it can be done, refrigeration is not the best way to store your garlic because it changes its texture, flavor, and speeds germination. Garlic can be stored in the freezer but keep in mind that freezing garlic changes its texture and flavor. Peel, chop, and store in small Ziploc bags. If you fill the bags lightly and freeze them flattened you can break off what you need later. Never store garlic in oil. Garlic in oil can be kept in the refrigerator for a maximum of 2 weeks. After that, it can develop dangerous bacteria/toxins. Garlic and oil at room temperature can cause dangerous toxins to form. Here are some helpful hints to make peeling your cloves a little easier. Blanch in boiling water for approximately 20 seconds, then drop into icy cold water. The skins will slip right through your fingers. Place cloves in a glass of cool water for 30 minutes and the skins will come right off. Using the old fashioned method, trim off the top and bottom of the clove and roll it between your fingers. Trim off the bottom of the clove, place flat on your counter or cutting board, pop it with the flat end of a knife. Purchase a ‘garlic tube’. It’s basically a flat piece of silicone. Wrap the cloves in the tube and roll it on the counter a few times. All garlic seed for sale is supplied by our small micro-farm in Elgin Oregon – Greif’s Gourmet Garlic!